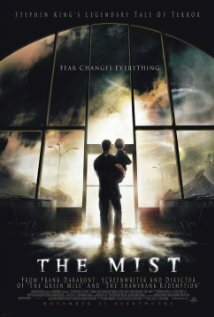 Stephen King’s The Mist was a better film than I had expected. Don’t get me wrong, I’m a huge Stephen King nerd and have seen almost ever film and read almost every book by him… but when this movie first came out, the trailer didn’t seem to grab my fancy. Last night, I caved and checked it out. Now, I’m completely unsure if I will have ** SPOILERS** in this review or not. I try not to include any form of spoilers but with this film, I think there is a decent amount to say about it. With that, you have been warned and I apologize in advance. Movie is: Suspenseful; Thrilling; Mysterious; Emotional – keeps you at the edge of your seat! This film was long but had a quick pace to it which is perfect for those that aren’t into slow movies (i.e. Storm of the Century), Although the film had a quick pace and jumped right in, it wasn’t too fast to ignore any form of detail or suspense. While watching this film, a lot of different emotions could be felt. Here are a few emotions I felt while watching the film: Anger, Sadness, Annoyance, Thoughtful, Curious. This film sticks out because although it is a Sci-Fi movie, it picks at the emotions of human and is more human than anything. I guess that’s what happens when you have a great story line and an awesome cast. The cast didn’t make it feel like it was some movie that a college kid thought up in their basement. They did a great job being believable in the roll they were in. Made it feel like you were also included in this grocery store struggling for survival. Speaking of that – the whole time I was watching this, I was contemplating in my head what I would have done in a situation such as this. Would I have panicked? Would I have been the leader? The follower? Or maybe even, I would be the sacrifice? I think I am the only one or at least one of the very few that finds deep meaning in films like this. It turns out the monsters are in the mist because of a confidential military experiment that went awry. Scientists became a curious cat and wanted to see if there was life in other dimensions or if it could be traveled through. Well sir, curiosity killed the cat. In this instance, I think it shows how we as humans allow our curiosity to sometimes impair are judgement on making smart decisions. We don’t just want to leave well enough alone and leave certain things up to imagination. No. Can’t have that can we? An absurd thought. Imagination is just for children in their schoolyards. Not mature-i-will-take-over-the-world-because-I’m-an-idiot adults. Mrs. Carmody is a “jesus freak” who starts reciting scripture from the bible and speaking about doomsday. In the beginning, it doesn’t phase people much until they see the creatures. Then, the start following Mrs. Carmody’s lead in praying for forgiveness and salvation. All the while this happens, she starts wanting to be the leader of everyone in the grocery store. She sacrifices a military man because he came clean about the experiment and offered him as a sacrifice as in order to survive they needed to have a “blood sacrifice to God.” Eventually, she wants to sacrifice anyone that doesn’t agree with her and her doomsday regime. Even tried taking a son away from his own father! This clearly shows how religion is used to prey on people when they are in their weakest and most desperate state. Instead of using as a tool to up lift spirits like it should be — It’s used as a threatening tool. Throughout the film, Mrs. Carmody (annoyed me all to hell) says that they are all going to hell for their sins and it’s their fault the monsters are here because no one is praying to God. Maybe not the exact words – but the gist of what she blabs throughout the whole film. I’m not saying all religious people act like Mrs. Carmody, but it’s rare to see someone who is religious who uses their faith to uplift those in a dark spot. These people needed uplifting… not being called demons or ridiculed. And surely the innocent army man didn’t need to be sacrificed to the tentacles. What I did like about this movie **SPOILERS????IDKMAYBE??? ** was that Mrs. Carmody was right about one thing: Stay within the grocery store, and you will be rescued. Not by Jesus but by the military coming to destroy the town and take out the survivors. The movie did have a sad and unexpected ending, but I do think it’s perfect for the film. I think there is symbolism with the group Mr. Drayton led into his car to try to escape the mist by driving away. Instead of sitting back and using our minds, in a desperate situation we sometimes act to quickly not giving anything a single thought. That’s exactly what Mr. Drayton did at the end of this film. He acted to hastily which lead him to live with a sadness and regret for the rest of his life. Over all, I give The Mist 10/10 Corpse Fetuses. Definitely check it out and tune in next time when I write about whatever the hell I want.